Century Media Records is pleased to announce the signing of legendary metal band DEMONS & WIZARDS for a worldwide collaboration. 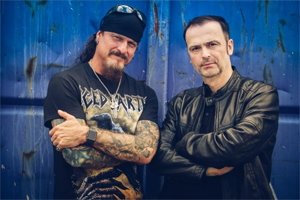 Founded in 1999 by Hansi Kürsch (BLIND GUARDIAN) and Jon Schaffer (ICED EARTH), DEMONS & WIZARDS released two albums Demons & Wizards (1999) and Touched By The Crimson King (2005). Currently, the band is busy recording the highly anticipated third studio album (title TBD), which is scheduled to be released in early 2020. "It is a great pleasure and a big honor for me to finally become a full part of the Century Media family,' states vocalist Hansi Kürsch about the signing. "Jon and I both feel that Century Media is the perfect match for our upcoming DEMONS & WIZARDS missions. And there will be plenty of them. Right at the moment we have not only finalized a re-boot of our first two albums, but are also working with full forces on the successor of Touched By The Crimson King. Good things are on its way. Expect nothing but the best and do not miss us on the road this summer, unless you want to risk another 20 years of waiting ..."
Century Media's Philipp Schulte adds,"To say that we are stoked to be finally working with Hansi and Jon on a new DEMONS & WIZARDS album would be an understatement. This is a very important signing to the label: A top-tier metal band and a great addition to the label's roster. The fans have been patiently waiting for DEMONS & WIZARDS' return. And now the time is near! We start our cooperation by re-releasing the band's two classic albums, before they are conquering the festival stages all across Europe. And then, in the beginning of 2020, after 15 years of waiting, DEMONS & WIZARDS will finally return with a new studio album. It is time to hoist the sails for the storm to come. Welcome aboard!" Prior to the release of the new studio album, Century Media Records will release DEMONS & WIZARDS' first two sold out albums as reworked special editions. Remastered by Zeuss (ICED EARTH, QUEENSRYCHE, SANCTUARY), both releases will be out on June 7th, 2019 as Limited Edition Digipak and limited Deluxe 2 LP releases with bonus material and liner notes by both members. On March 29th, 2019, the digital standard versions of the remastered albums will be available to promote the band's festival run in Europe.